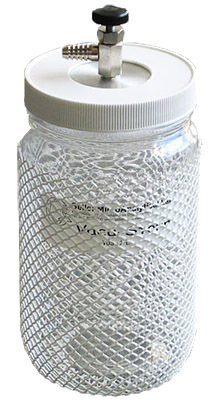 The Vacu-Storr high vacuum glass storage container have been especially deveoped for protecting materials and samples which are senstive to dust, moisture, oxygen or other gases found in the environment. The containers consists of a sodalime glass jar, nickel plated aluminium lid, viton O-ring seal and a metal sealed high vacuum valve. The high vacuum valve has a 6mm (1/4”) barbed hose fitting to connect the hose to a vacuum pump or vacuum pumping system. 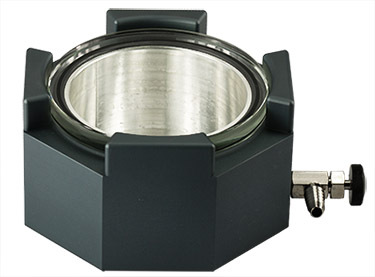 The Vacu-Storr desicccators are capable of reaching a vacuum level of 10-4mbar and expect to have an estimated vacuum holding time of 5 years to 100mbar. There are 4 sizes available; all supplied with a protective plastic netting and a protective polymer coating on the outside to prevent damages.